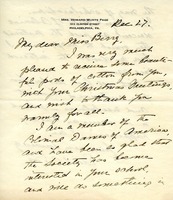 Mrs. Ross writes to Martha to thank her for the cotton, and in turn sending a box of pictures for the children she remembers Martha asking for before. Mrs. Ross also advises Martha to remove the New York address as she believes that her name is listed twice in the Berry's address lists. Mrs. 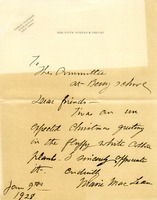 Page thanks Miss Berry for sending her pods of cotton, and her Christmas greetings. MacLean thanks Berry for her unexpected Christmas present oof fluffy white cotton plants. Someone from the Phoenix mental life insurance Co. sent Martha Berry a thank you letter after she sent them "Cotton greetings for Christmas". 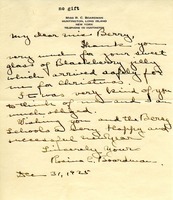 Miss Anna Swenson wishes the Berry Schools a merry Christmas and a happy New Year and donates $5. 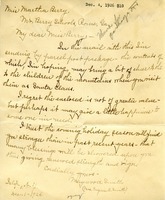 Maywood Smith (Mrs. Eugene R. Smith) sends Martha Berry a parcel with gifts for Martha to distribute to the mountain children when she visits as Santa Claus. 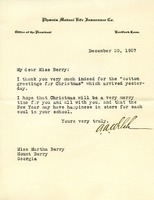 Mrs. Smith hopes that Martha Berry will be stronger and have renewed vigor this holiday season. Page two of the letter has shorthand notation. 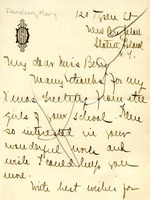 Mary S. Davidson thanks Martha Berry for her Christmas greeting from the girls at the school. She is interested in Martha Berry's wonderful words and wishes she could help more. 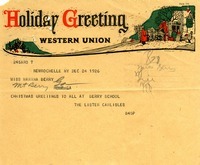 Christmas greetings to The Berry School with a $1,000 gift. The Lister Carlisles send Christmas greetings to all at the Berry Schools. 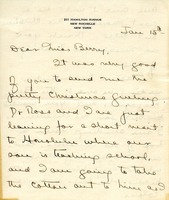 This letter was sent to Ms. Berry thanking her for a jar of blackberry jelly she sent and also to wish the schools well.